In addition to recognizing physical therapy with National Physical Therapy Month, October is also Breast Cancer Awareness Month, an annual campaign intended to increase awareness of the disease and the screening tools and treatments available for it. As the second most common type of cancer in women, breast cancer will affect 1 in 8 women at some point in their lives, and about 240,000 new cases are diagnosed in the U.S. each year. 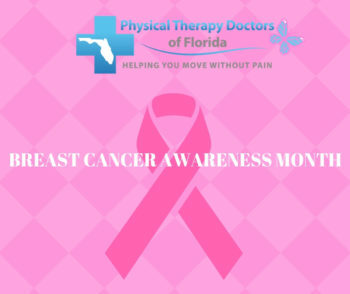 In honor of Breast Cancer Awareness Month, Physical Therapy Doctors of Florida in Bradenton, FL would like to explain the assistance we can offer women during the recovery process from breast cancer treatment. Many women diagnosed with breast cancer will go on to have some type of surgery, which may include a breast biopsy, lymph node biopsy or removal, lumpectomy, mastectomy or breast reconstruction, in addition to other treatments. Following these surgeries and other treatments like radiation or chemotherapy, many patients experience pain and stiffness in the chest, shoulder and back muscles, as well as nerve irritation that can cause numbness, pain and a tingling sensation. These issues are secondary complications from the treatments necessary to resolve the cancer, however the problems that they can cause for women can be resolved under the care of a skilled physical therapist. Recovery will vary for each patient depending on the severity of their cancer and specific treatments used, but these side effects will often reduce flexibility and range of motion, which can prevent women from returning to their normal daily activities and significantly decrease their quality of life. In addition, any woman that’s undergone various treatments and hospitalizations in their fight against cancer is usually very deconditioned due to lack of physical activity and will have additional difficulty functioning normally due to limited endurance and strength. Recovering from breast cancer treatment on top of the breast cancer should be celebrated, and you should not be burdened with the physical side effects that it can cause. At Physical Therapy Doctors of Florida, FL it’s our goal to tend to any side effects you may be experiencing and help you return to your pre-treatment physical activity levels, ultimately “Helping You Move Without Pain.” To find out more about our program for addressing side effects from breast cancer treatment or to schedule an appointment, contact us at 941-264-1414.